Reading that title again, it occurs to me that it could be interpreted a couple of ways. I only wish I could say that my own productions from my pseudonym Ebauche had been played that many times, unforutnately that’s not the case. No, I’m talking about all the music that I’ve tracked through Last.fm’s scrobbling system. I’ve been scrobbling for just over 2 years and 2 months now. That’s approximately 790 days of keeping track of things, and whilst I did track stuff played on my Mp3 player for a little while, I got bored with transferring the information and haven’t done it in a very long time. So, that comes out at about 37 tracks a day on average. Which, when I think about it, is quite a lot really. For the sake of, well, perhaps no one other than myself, here’s my top artists over the past 30,007 plays. If I remember, I’ll post these up at various intervals so that I can track my own listening habits over time. 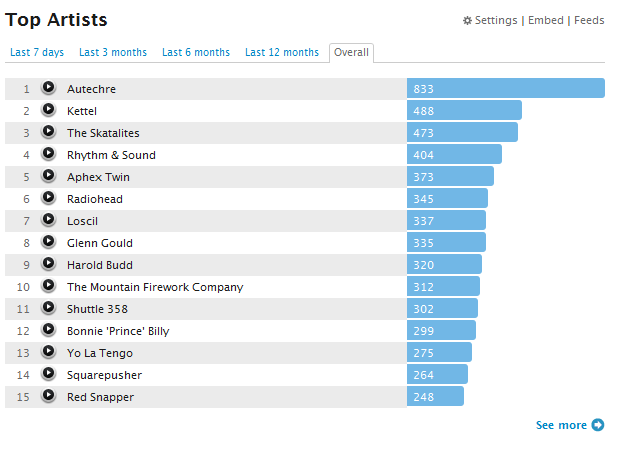 My overall leaderboard at 30,000 plays!